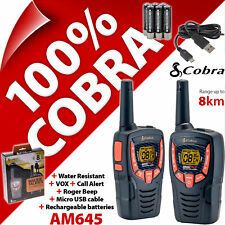 This pair of Cobra two way radios are in good pre-owned condition. Includes two radios with belt clips, charging dock and micro USB cable. No batteries included. The radios operate off 3 AA batteries. Cobra Waterproof Walkie Talkie Radio. 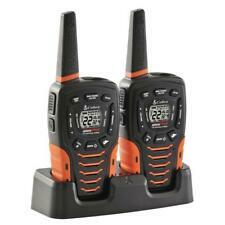 Cobra CXT385 2 Pack 2-Way / Weather Radio Walkie Talkies 23 Mile Range NEW !! 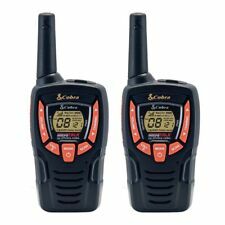 4.5 out of 5 stars - Cobra CXT385 2 Pack 2-Way / Weather Radio Walkie Talkies 23 Mile Range NEW !! 3 product ratings3 product ratings - Cobra CXT385 2 Pack 2-Way / Weather Radio Walkie Talkies 23 Mile Range NEW !! It may or may not include the original box. If you’re looking to buy jewelry and electronics, you’ll strike a great deal here at PB Pawn and Jewelry. GMRS-FRS Cobra Two Way Radios,10 Mile Range, PR-190-2VP. The batteries are corroded (they are 2008s) and you'll need to get 6 new AAAs for this. The FRS200 is a little thicker than an average FRS radio, but overall it's compact and fits nicely in your hand. The construction of the FRS200 isn't as good as that of the more expensive radios, nor is its overall design, but with such a low price, these tradeoffs are expected. 22 channels. 10 NOAA(R) weather channels. Item #: RA45994. Weather alert. Water-resistant (IPX2). Tested and works well. 16 mile / 22 channel. Unit has some light scuffs from normal use but is in overall clean condition. Please see photos. You will receive only the pictured item. Smoke free. CobraWalkie Talkie. The walkie talkies are used but are in overall good condition. They are tested and work fine. Batteries NOT INCLUDED. They take normal triple A batteries though.not included. What you see there (the two radios) is what you receive. 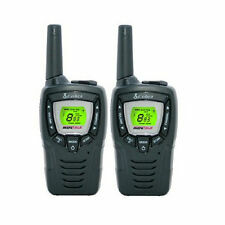 New, in box, Cobra - PRO series 28-Mile FRS 2-Way Radios (Pair) - Black. Provides a clear view of the radio's status. So you and your driving, hunting or hiking partner can keep in touch (range depends on terrain and conditions). 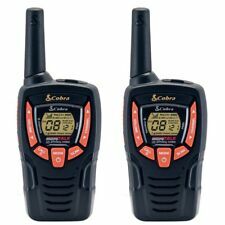 Cobra MicroTalk FRS1102 2-Mile 14-Channel FRS Two-Way Radio (Pair) (Sun Burst). Cobra's FRS 110-2 is a family radio service (FRS) walkie-talkie. The external slide switch allows you to talk on all of the 14 available FRS bands, and it includes 38 sub-bands per channel. COBRA MicroTalk FRS 220 2-Mile 14-Channel FRS Two-Way Radios - FAST SHIPPING! Still in very good condition! Set of 4 COBRA FRS225 MicroTalk 14 Ch 2-Way Radio Walkie Talkie - all power on. See pictures for details. Each unit uses 3 AA batteries - not included. We will work with you to resolve any problems within 24 hours. 5 VOX sensitivity levels allow user to select at which point the radio will detect their voice. Ref: P3/1/WTA. Backlit LED Display. Call alert provides 5 recognisable tones for incoming transmissions and the selectable on/off Roger beep indicates it's clear to talk. Micro-USB cable. 2 x radios. Up to 8km range. Communicates with all other PMR 446 radio's. They have 8 channels at frequency 446MHz. Compact design with extended range. Power Saver. Micro-USB charging cable. LCD Display. Auto Squelch. Five selectable tones will distinguish between different parties for incoming calls. A total of 2662 channel combinations are available when the 22 channels are combined with the 121 privacy codes (38 CTCSS/83 DCS). Cobra MT975 PMR 12Km Walkie Talkie Quad Pack - GorillaSpoke, Free P&P IRE & UK! MPN FRS2352VP. Service FRS. Features Auto Squelch. Features Water Resistant. Features VOX. Cobra Compact Walkie Talkie with VOX, Call alert, 8km Range and over 968 Channel. 5 VOX sensitivity levels allow user to select at which point the radio will detect their voice. A unique circuit extends the life of your batteries.